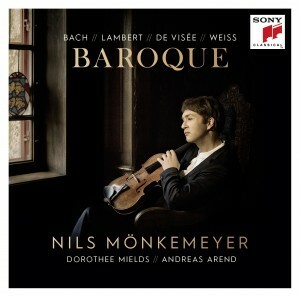 April 2018: Sony Classical releases the tenth solo album of Nils Mönkemeyer, with a very special program – works of German and French Baroque, with chamber music partners like the soprano Dorothee Mields and the lute player Andreas Arend, with whom he has collaborated since many years. The CD includes a world premiere recording of the F minor Suite for théorbe and lute by the composer Robert de Visée (1650-1732), as well as the famous Bach Choral “Nun kommt der Heiden Heiland” in a version for viola and lute. The Suite for Viola solo BWV 1011 is beautifully combined with the Suite BWV 995 for Viola and théorbe, as both are based on the same melody.